On August 30, 2017, a ceremonial event was held to mark the event of the first tram running on the new route between RB Ülemiste and Tallinn Lennart Meri International Airport. The new tramline is offering convenient travel alternative between the airport and the city centre for both citizens of Tallinn as well as its guests. The construction of a tram extension was a partnership between the city and the state. “The new tram line, which now connects the airport, Rail Baltica future main passenger terminal in Ülemiste and the center of Tallinn, is the first tangible result of Rail Baltica, the century’s infrastructure project, in Estonia. 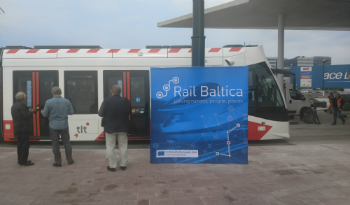 This is a good example of how the projects can be implemented smoothly in cooperation with the various partners and create new quality in terms of transport connections,” said Kristjan Kaunissaare, coordinator of the Rail Baltica project in the Ministry of Economic Affairs and Communications. The tram line construction began in August, 2016, and works will be completed in full no later than November, 2017. The tram and tunnel were built by AS Merko Ehitus Eesti and KMG Inseneriehituse AS. The construction of the tramline link between RB Ülemiste and Tallinn Airport is funded by the European Union from the Connecting Europe Facility (CEF) grant for the construction of the Rail Baltica infrastructure as it is necessary to improve the connectivity in Tallinn by carrying more passengers to and from the Rail Baltica terminal in Ülemiste once it will be developed. Additionally, this step goes along with the project’s aim to reduce the pollution that is arising not only from daily usage of personal transportation for longer travels, but also from the use of private cars and taxies within the city to arrive at the terminal. It is estimated that the trams will be scheduled to run every 6 minutes during the peak hours. The cost of the works are approximately 11.5 million euros. 85% of the costs are financed through CEF funding in the frame of the Rail Baltica Global project development including construction of adjoining infrastructure. The national co-financing is paid by the City of Tallinn. The further plans for this year in the project development in Tallinn includes study on the best way to connect the Ülemiste terminal and the Tallinn Old City Harbor with a tram. The ultimate aim is to interconnect three European significance transport hubs in the city of Tallinn.